The Lexicon 300L not only contains the finest sounds, as you’ve come to expect from Lexicon, it incorporates new functions that satisfy the needs of today’s audio production. For both analog and digital use the Lexicon 300L takes full advantage of recent advances in converter technology and combines them with flexible digital interfacing. The A/D and D/A converters use oversampling techniques to minimize low-level distortion and provide linear phase characteristics. 64x oversampling Delta/Sigma conversion is used in the A/Ds; 8x oversampling is used in the D/As. The result is sonic transparency without the artifacts normally encountered in conversion. The digital I/O simplifies interfacing with both the AES/EBU professional and the EIAJ consumer format. XLR, RCA and Optical connectors are provided for both input and output. The digital inputs of the Lexicon 300L will automatically accept and lock to any AES/EBU/SPDIF format; the Lexicon 300L’s digital output format is user-selectable for feeding either professional or consumer equipment. This allows for format conversion as well as using the high quality A/D converters to feed digital recorders. Control of additional Channel Status information is provided as well. The Lexicon 300L utilizes two proprietary high performance DSP engines. The configuration of these engines can be determined by the end-user to suit a particular audio application. The Single Setup configuration unites both DSP engines. Two “split” configurations: Dual Mono and Cascade, allow each DSP engine to run a special program especially designed for “Split “ applications. The Single algorithms include: Random Hall, Random Ambience, Rich Plate, Stereo Pitch Shift, and Stereo Adjust. The “split” algorithms include: Dual Delays, Chamber, Mono Pitch Shift, Compressor, a special mastering dither program called PONS (Psychoacoustically Optimized Noise Shaping), and a less extensive version of Stereo Adjust. The Lexicon 300L makes effects automation available in three different ways. If you use time code, the 300’s Event List and Time Code Reader add a new twist to effects processing. Each entry in the 50-item list contains a time code value and a Lexicon 300L effect preset/register number, allowing incoming time code to trigger setup and effect changes, as well as setup and effect parameter glides. For changing effects in music or changing rooms and environments for film and video, the Lexicon 300L’s time code capability opens new avenues to all time code users. Dynamic MIDI is included for real-time performance control and effects automation. All parameters in the 300L can be patched to most MIDI controllers, allowing full control from remote devices. 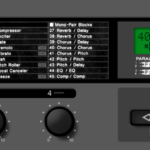 For full MIDI automation all parameter changes can be recorded on any sequencer. For additional control, complete System Exclusive information is available. Even with the best functions and features, the heart of any signal processor is its sound. The Lexicon 300L contains the very best of the Lexicon Sound – with new refinements such as dynamic size parameters in the Reverb and Ambience algorithms. We have also included stereo and mono pitch shifting, both straight delay and modulated delay effects, a mastering algorithm with precision level/balance controls and equalization. These sounds, combined with analog and digital audio I/O, time code based effect change, an internal LFO, and full MIDI automation result in a system that provides new creative options each time you use it.